This work, which Pollock showed at his first solo exhibition, Pollock, held in November 1943, attracted the special attention of critics. As Clement Greenberg later recalled, “at that time there were other more gifted and more successful artists, but none of them could express themselves in their paintings as honestly and impressively as Pollock did.” Pollock depicted two abstract figures of “guardians”: the female figure is on the left, and the male figure is on the right. “Keepers” are carefully examining the moss-covered fragment. Some of these symbols are borrowed by the artist from African-American primitivist painting, the other part – from mythology. Some signs directly refer us to the artistic worlds of Picasso and Miro. Based on the fact that Pollock was fond of Jung’s psychoanalytic theory, it can be assumed that the characters depicted by the artist are designed to express the mysterious images born of his subconscious. 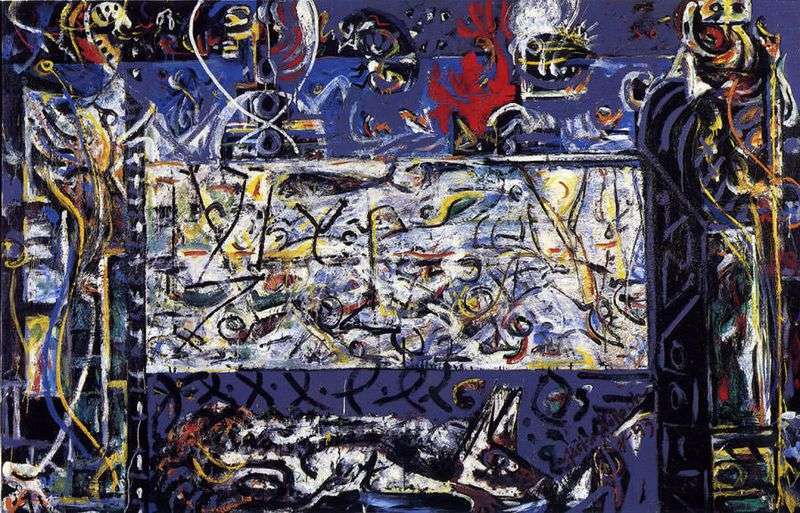 Description and meaning of the painting Keepers of Secrets by Jackson Pollock.